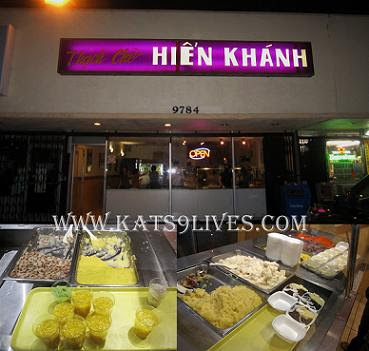 Kat's 9 Lives: Thạch Chè Hiến Khánh : Double Take? Wasn't I just at the other place called Thạch Chè Hiến Khánh too? They both have the same name but are the same store? Are they owned by the same people or a family business? I am not sure but they do taste different. The sign on the door looks a bit different. Regardless, PK and I made a trip to this location since I took her to the one located on Bolsa Ave. was not up to her standards. For me, I am not that picky about it because I never plan to buy that much and I just dabble in some of the desserts. PK remembers this location on Westminster and told me that it's the one that her landlady likes. So I allowed myself to splurge a little and try a bit more. The first thing I grabbed was the Flan Pudding Cup. I am a big fan of flan and they are usually a pretty good deal at Vietnamese dessert places. There weren't any labels, but I am going to assume they are $1 each or maybe a little more. I was satisfied with my choice because while we were waiting a guy came in and bought 10 of them. Must be good or why would he pull so many out of the fridge, right? lol It's close to your typical flan that you can make at home. Personally I think I should just break down and make my own from mix because those are actually pretty tasty! The one here was a little more runny and airy in texture. It wasn't as sweet as the ones from packages. Still, it was nice and refreshing to finish the day off.